The Desjardins Odyssey Visa Infinite Privilege currently has an Informr score of 10 out of 10. This score is based on our evaluation of 1 sources including reviews from users and the web's most trusted critics. 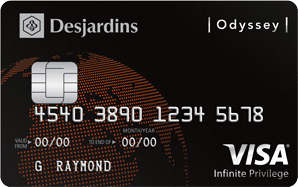 Desjardins Odyssey Visa Infinite Privilege is typically available to those with excellent credit scores (650 or greater). Yes Have a minimum personal income of $200000. - Hotel Benefits including an automatic room upgrade (when available), complimentary daily breakfast for 2 and a US$25 food and beverage credit. - Ski Resort Benefits including priority access to lifts, reserved parking and discounts on lift tickets, equipment rentals, lessons and lodging at resorts including Mont-Tremblant and Mont-Sainte-Anne.